MDP and I bought tickets for the Old 97’s show at Brooklyn Bowl about a month ago. So, when the day came, I was pretty excited to get there. Although the doors weren’t slated to open until 8 pm for the show, we knew we could grab a bite at the bowling alley beforehand. I took the L train to Bedford, hopped off and made my way over to Brooklyn Bowl, which is located on Wythe between North 11 and North 12 streets. My walk was pleasant. I hadn’t realized Williamsburg possessed such charm. I suppose I can count on one hand the number of times I’ve been to the neighborhood since I was in college, and that may explain my surprise at the cute eateries and shops that lined Bedford. Anyway, I turned down North 11 Street to cut over to Wythe, and locked eyes with a gentleman who was sampling a beer in an outdoor café. 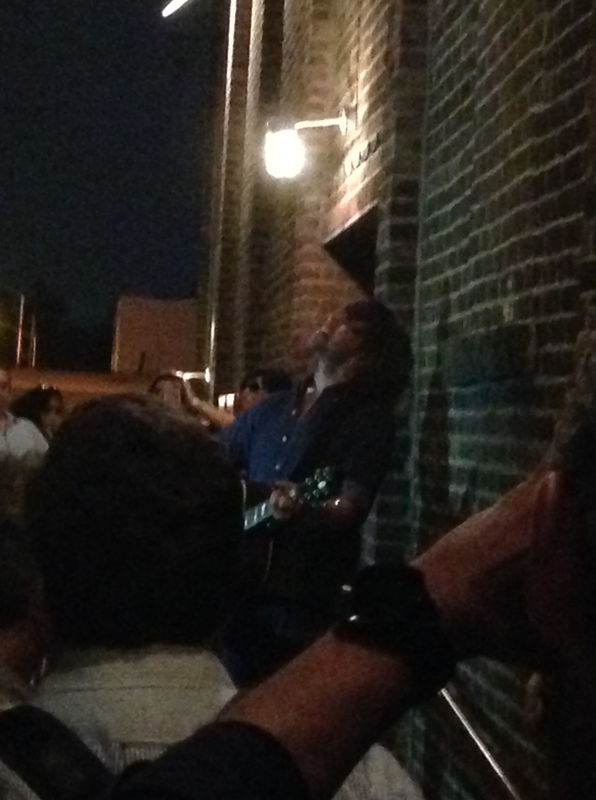 He looked familiar, but I kept walking—that is, until I realized it was Rhett Miller, front man for the Old 97’s. What if it isn’t him? What if he thinks I’m crazy? After about five minutes of hemming and hawing, I walked over to him and said, “Hey, you look familiar. Are you Rhett Miller?” He smiled and nodded, and stood up to introduce himself. “I’m Rhett,” he said. I know, I thought, but told him my name instead. “You’re awesome. I love your music,” I said, sounding 16 years old. I added that I was going to be attending his show later in the evening, and he said he was planning to sing a duet with the opening act. “I’ll be there at 8 then,” I told him and blurted out “enjoy” for some reason. What an evening this is going to be! I thought, as I made my way over to Wythe. Well, the night took an unexpected turn. Apparently, Brooklyn Bowl had a power outage earlier in the day. It didn’t occur to me until after I tried to unsuccessfully order a burger that the lack of power might affect the show. It did. 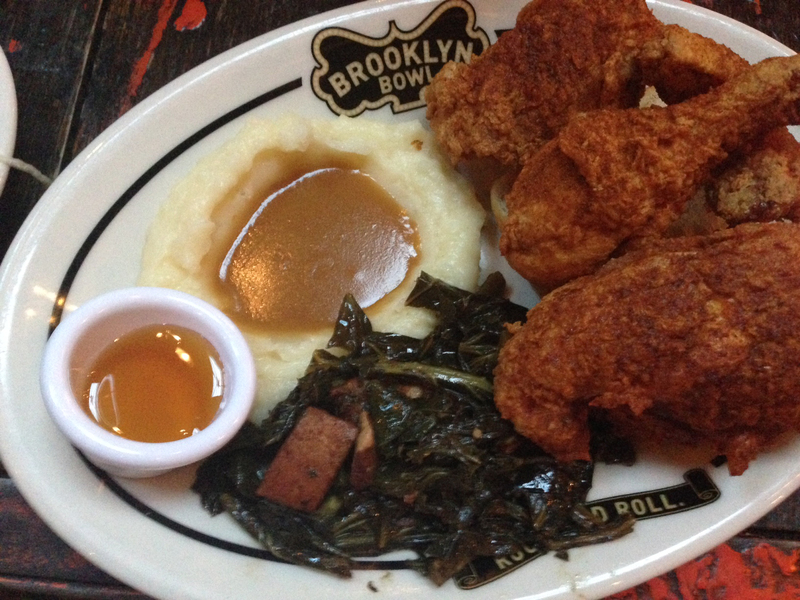 But before that realization struck, MDP and I sampled some delectable food from Brooklyn Bowl. First of all, it’s worth mentioning that this place is pretty awesome. It’s a huge space with a stage, bowling lanes and a restaurant. Oh, and the bathrooms are clean and pristine, up a flight. They have Brooklyn Brewery beers on tap, and Blue Ribbon food (whether that means the recipes or the chefs are trained a la Blue Ribbon is a mystery). 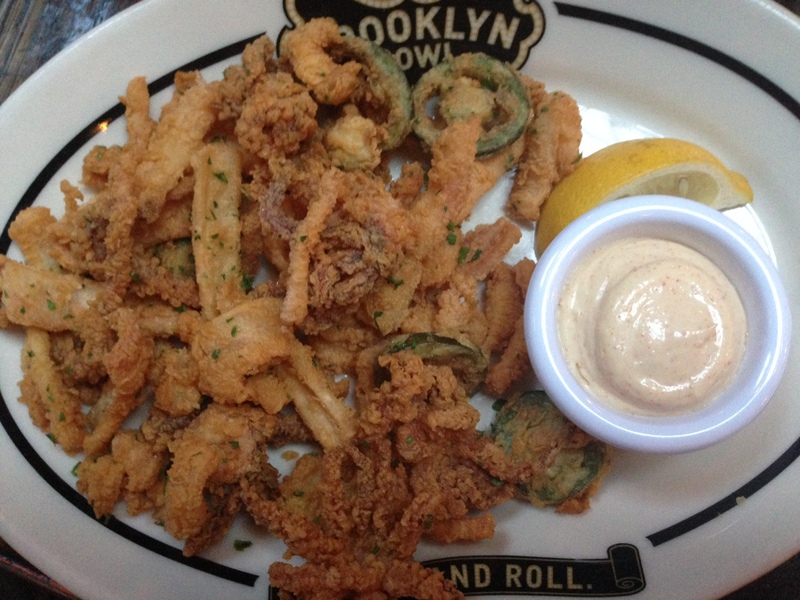 We started our meal with the fried calamari, which was crisp and delicious, and came with fried jalapenos mixed in with the octopus. It also had a lemon and cayenne mayo and an authentically included lemon wedge on the side. Fantastic! When I learned the burger was not an option due to the down grill, I opted for the fried chicken dinner, with mixed pieces (dark and white meat). It came with the best collard greens I’ve ever had. Thick pieces of bacon were mixed in with them and they had a perfect flavor. The mashed potatoes were so-so, but the chicken was decent. The fry on the chicken was very flavorful, but I’m sorry to say that the flavor did not seep down into the bird’s flesh as it does at many other places. The dish also came with a hefty slice of white bread, which I rather enjoyed. MDP got the fried catfish sandwich, and he seemed to enjoy it very much. I’m no fan of catfish, so I didn’t sample a bite. We waited around for about 40 minutes until we heard through the grapevine that the show was canceled. But I happened to notice Rhett traipse down the stairs and into the back of the stage. He was carrying his acoustic guitar. Suddenly, he was gone, and I thought, He must have gone outside. There we went, and we found Rhett singing on the sidewalk of Wythe, outside of Brooklyn Bowl. He played around seven songs, much to the crowd’s delight. We all sang along to “Wish the Worst” and “Big Brown Eyes” and Rhett even did a few tunes from the new album, such as the title track “Most Messed Up” and Let’s Get Drunk & Get It On.” Mostly, Rhett sang/shouted the lyrics, but he still sounded great. “I have to stop singing or else I think I may never sing again,” he shouted to the screaming crowd of about 30. UPDATE! 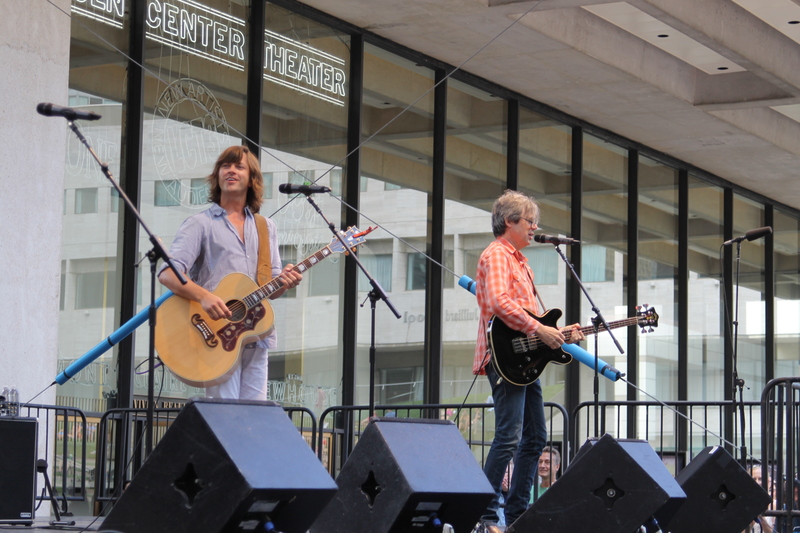 Saw the Old 97’s today at Lincoln Center and got a much better shot of them! So, definitely go to Brooklyn Bowl. But make sure the power’s working if you’re planning to see a show or bowl. It’s good eatin’, for sure, but if you’re making the trek to Williamsburg, you’re going to want to do more than eat good food. Take the L to Bedford and walk a few blocks west then north.